Has the preparation for the holidays taken its toll on you? Take a page out of this student’s life and Relax! While walking from my morning class back to my office, I came across this student who had strung up his hammock in the trees between two buildings. He definitely found a portable way to relax, especially since this was the first week of classes. You are enough. You have enough. You do enough. Be sure to take some time for yourself this season and find even a few moments to relax! Feel free to add your photo to the WordPress Weekly Photo Challenge offered every Friday! What a brilliant idea. I can remember falling asleep in the library more than once…and maybe in class once in a while. That’s nice and all Terri, but it is 22 freaking degrees here today!!!!! Only polar bears and Eskimos would take the time to pull out their trusty hammock and relax in this crap! Oh sorry I was ranting, lovely picture and even better message :). Haha! This was taken the first week of classes in September, when it was 98 degrees. Thanks, Gary! Thanks for your comment! 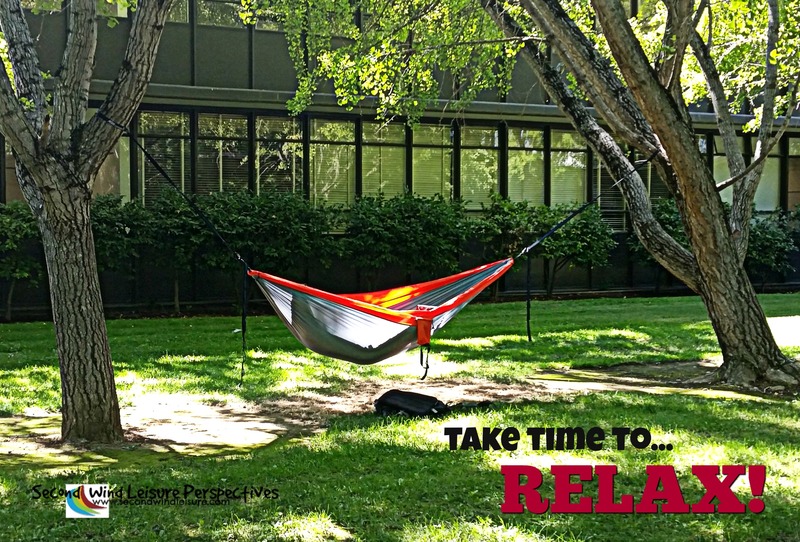 Leisure time is so important, even when we are busy, especially! Hope you get it done! Gosh…a truer saying has never been spoken!! thanks for the reminder, Terri! Oh I needed to read this Terri as life is just too hard at the moment. Thanks for the reminder and I love the falling snow on your screen. Hope you enjoy the hammock! I wish it was me in that hammock! I own one though. Thanks and hope you find some “you” time, Sue! This is a such a great photo,Terry. I have retweeted this post as this is very timely advice for the holiday season. Thanks for sharing. Thank you, Donna! Much appreciated. Wow, I definitely need one of those portable hammocks! Cool, huh? I was so lucky to get that photo! THat looks like fun and relaxing! I thought he was pretty clever! Nice post, I have a post on same topic in my drafts.. will publish it soon.. I would like everyone to meet Second Wind Leisure Perspectives! !